Consider it a cave for archeological excursions. Use the information at your own discretion. The International Mathematics Olympiad (IMO, also known as the International Mathematical Olympiad) is an annual mathematics competition for high school students [IMO Article in Wikipedia]. It is one - in fact, the oldest - of the International Science Olympiads. The first IMO was held in Romania in 1959. The problems come from various areas of mathematics, such as are included in math curricula at secondary schools. Finding the solutions of these problems, however, requires exceptional mathematical ability and excellent mathematical knowledge on the part of the contestants. Properties of the orthocentre, Euler's line, nine-point-circle, Simson line, Ptolemy's inequality, Ceva and Menelaus etc. My report on IMO 2002 provides further details of how the IMO is run. A list of recommended mathematics literature for self-study is slowly evolving. Without doubt, these lists of web addreses are far from complete. If you send relevant web addresses that are not listed here, then they will be included. A new website about the IMO, including a problem and results archive. These Regulations define the IMO as of ?. New aspects are the IMO Advisory Board and the IMO Trust Fund. The 50th IMO will be hosted by Germany in Bremen on 10-22 July, 2009. The 51st IMO will be hosted by Kazakhstan in ? on ?-? ?, 2010. The 52nd IMO will be hosted by the Netherlands in ? on ?-? ?, 2011. The 49th IMO was hosted by Spain in Madrid on 10-22 July, 2008. (arrival day for contestants is 14 July). The 48th IMO was hosted by Vietnam in Hanoi on 19-31 July, 2007 (arrival day for contestants is 23 July). The 47th IMO was hosted by Slovenia in Ljubljana on 6-18 July, 2006. The 46th IMO was hosted by Mexico in Mérida, Yucatán, on 8-19 July, 2005. The 45th IMO was hosted by Greece in Athens on 6-18 July, 2004. The 44th IMO was hosted by Japan in Tokyo on 7-19 July, 2003. Submission deadline for problems was 15 Feb. 2003. The 43rd IMO was hosted by the United Kingdom in Glasgow on 19-30 July, 2002. The 42nd IMO was hosted by the United States of America in Washington DC on 1-14 July, 2001. The 41st IMO was hosted by South Korea in Taejon on 13-25 July, 2000. The 40th IMO was hosted by Romania in Bucharest on 10-22 July, 1999. The 39th IMO was hosted by Taiwan in Taipei on 10-21 July, 1998. The 38th IMO was hosted by Argentina in Mar del Plata on July 18-31, 1997. There is an IMO97 mailing list. The 37th IMO was hosted by India in Mumbai (Bombay) on July 5-17, 1996. The 36th IMO was hosted by Canada in Toronto on July 10-28, 1995. The 35th IMO was hosted by Hong Kong on July 12-19, 1994. The 34th IMO was hosted by Turkey in Istanbul on July 12-19, 1993. The network for the participants to the IMO. Has information on three mailing lists (for IMO'99, IMO2000, and IMO problems). The Mathematical Association of America (MAA) carries some information on the IMO and publishes books with IMO problems. This site has some statistics about scores at IMO 1993 an on (except 1994). Maintained by Joseph Myers. 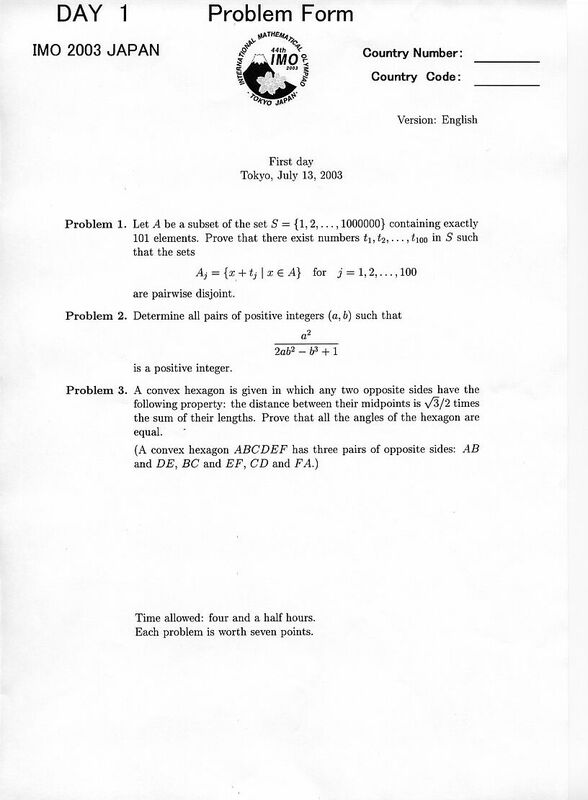 More than one hundred years ago, D�niel Arany, a high school teacher from the city of Gy�r, decided to found a mathematical journal for high school students. His goal was "to give a wealth of examples to students and teachers". The journal's first edition appeared on January 1, 1894. MathPro Press specializes in the publication of compendiums and indexes of mathematics problems. The World Federation of National Mathematics Competitions (WFNMC) publishes a journal entitled Mathematics Competitions. Also see Australia below. Publishes articles, notes, problems and solutions in school mathematics and informatics. Is devoted to teachers and students, who are interested in mathematics and informatics clubs, olympiads and competitions. This new quarterly journal is aimed at pupils, students, and teachers interested in mathematical problems and puzzles as well as in the history of mathematics and its new trends. SIPROMA is the ``Sociedad Iberoamericana para la Promoci�n de la Matem�tica''. Created in 1977 by Dr. George Lenchner, an internationally known math educator, the Math Olympiads went public in 1979. In the year 2000, over 120,000 students from 5,000 teams worldwide participated in the Olympiads, representing 26 countries. Living Maths (South Africa) organizes the International Living Maths Mathletics Olympiad for ages 6 to 13 (K-7). Look under: Events, Olympiad. Problems in English and French. The Colorado Mathematical Olympiad (CMO) is the largest essay-type mathematical competition in the United States, with 600 to 1,000 participants competing annually for fine prizes. Home page (in Spanish) of the Olimpíadas Iberoamericanas de Matemática (OIM). The Math League is dedicated to bringing challenging mathematics materials to students, and specializes in math contests (for high schools in the USA and Canada), books, and computer software. The Olimpíada Matemática Argentina (OMA) is the Argentinian Mathematics Olympiad. Currently, information is only available in Spanish. The Australian Mathematics Trust (AMT) is a national non-profit organization which conducts mathematics competitions in Australia. Includes information on the WFNMC. The Flanders Mathematics Olympiad (Vlaamse Wiskunde Olympiade = VWO), maintained by Paul G. Igodt (Paul.Igodt@kulak.ac.be). The Olympiade Mathématique Belge (OMB). Information about the Brazilian Mathematics Olympiad (OBM=Olimpíada Brasileira de Matemática). All material in Portuguese only. Information about the National Mathematical Olympiad in Bulgaria as part of the Bulgarian Competitions in Mathematics and Informatics. Information about the Canadian Mathematics Competition (CMC) maintained by Ruth Malinowski (cmc@math.uwaterloo.ca). The Canadian Mathematical Society also has an Olympiads Home Page. The WWW Home Page for the Colombian Olympiads (in Spanish), covering Mathematics, Phyisics, and Informatics, maintained by Fernando Vega Salamanca (fvega@zulima.uanarino.edu.co). Information about the Estonian Matemaatika Olümpiaadid (also in the Estonian language), maintained by Uve Nummert (uve@math.ut.ee). Includes IMO information (in English). Information about mathematics competitions in France, includes French translations of IMO problem sets and recommended French mathematics literature for IMO preparation. The Verein Mathematik-Olympiaden e.V. coordinates the German Mathematics Olympiads (DeMO). There is also information available about the German Mathematics Olympiad 1995. Information on Irish participation in the International Mathematical Olympiads and (eventually) copies of Irish Maths Olympiad questions and photographs. Contact: Gordon Lessells (gordon.lessells@ul.ie). Information about the IMO in general (starting from 34th) and the Mathematical Olympiad Foundation of Japan. Maintained by Naomasa Maruyama (maruyama@ism.ac.jp). Information (in Spanish) on the Mexican Mathematics Olympiad (OMM) and problem sets (mostly in Spanish) of various (regional) mathematics contests. E-mail: omm@hp.fciencias.unam.mx. Maintained by Felipe Lemaitre Carabias (iker@hardy.fciencias.unam.mx). There is also an unofficial page for the Mexican Mathematical Olympiad (in Spanish), maintained by Pedro Sánchez. Pierre Fermat Math Competition (in Spanish: Concurso de Matemáticas Pierre Fermat). Information about the Dutch Mathematics Olympiad (now also in English), maintained by Tom Verhoeff (Tom.Verhoeff@acm.org). The Niels Henrik Abels Mathematics Competition selects students for partiticipation in the IMO. This site also contains problem sets of the Norwegian Mathematical Olympiad and the IMO, including some solutions and results. Maintained by Einar Andreas Rødland (einara@math.uio.no). Information about Peru's math olympiad and the Cono Sur olympiads, maintained by Enrique Valeriano (evaleri@pucp.edu.pe). Information (including problem sets) on the math olympiads in which Polish high school students participate (in particular: the Polish Mathematical Olympiad, the Austrian-Polish Mathematics Competition, and the Baltic Team Contest). Maintained by Krzysztof Chelminski (chel@mathematik.th-darmstadt.de) and Waldemar Pompe (waldipo@mimuw.edu.pl). Information about the IMO and Singapore's participation. Mathematical competitions in Slovenia are supervised by DMFA. Information and problem sets (in Spanish) for the math olympiads in which Spanish high school students participate, including the Spanish Mathematics Olympiad (Olimpiada Matemática Española = OME). Maintained by Cristobal S�nchez Rubio (csanchez@platea.pntic.mec.es). Unoficcial Spanish Math Olympiad page maintained by Ramon Esteban Romero (Ramon.Esteban@uv.es). Information about the Swiss participation in the IMO in English, French, German, Italian. Information about the British Mathematical Olympiad (BMO). The UK IMO Register offers a lot of historic information about the UK's participation in the IMO. Do browse the Leaders's Reports. Related: United Kingdom Mathematics Trust (UKMT), a registered charity which conducts a number of mathematical enrichment activities via schools. Information on the USA Math Olympiad and the IMO. The American Mathematics Competitions (AMC). The USA Mathematical Talent Search (USAMTS) is a free mathematics competition open to any US middle or high school student. It is a great contest for students aspiring to Olympiad problem solving, since many of the problems require proof-based solutions. 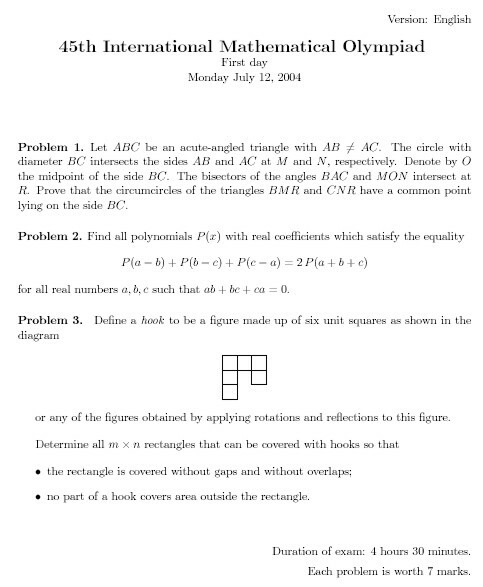 Here you will find a large collection of olympiad problems from all over the world. You will also find all the information regarding The IMO Compendium , the most complete collection of problems proposed to the International Mathematical Olympiads. The Art of Problem Solving contains a variety of resources for avid students of mathematics in middle and high school. There are many free resources (in addition to a Forum) such as articles, a LaTeX tutorial, and online Math Jam sessions. Olympiad problem solvers from all over the world participate in problem discussions. The site also sells a set of problem solving textbooks and has an online school. Includes IMO Problems and Solutions, with authors. This website covers some general techniques for solving mathematical problems. It intends to grow into an interactive website. Maintained by Harold Shapiro. Math problem collections, a frequent (hard!) math contest, and a large problem solving community with many on-line formus for discussions. Maintained by Valentin Vornicu. Includes Problems in Elementary Number theory (PEN), Topics in INequalities (TIN), and Problem-Solving Web-Directory (PSD). Archive maintained by Hojoo Lee (a.k.a. "ideahitme") in Republic of Korea. A forum around the number-theory problem collection of Hojoo Lee (see above). Archive maintained by Hans Vernaeve (Hans.Vernaeve@rug.ac.be) in Belgium. Provides: a collection of problems, tutorials, training material, articles, a Monthly Internet Mathematics Olympiad, and information on the New Zealand Math Olympiads. 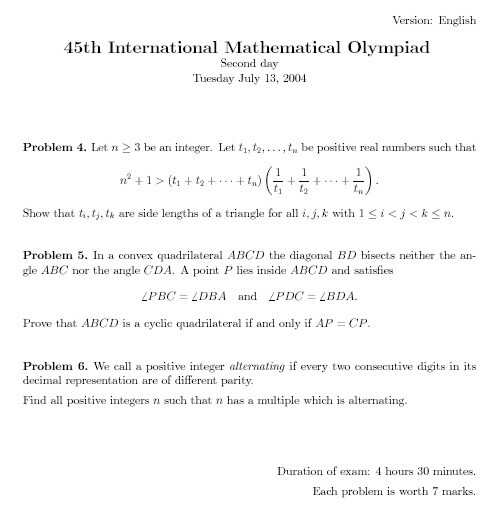 Kiran Kedlaya (MIT, USA, kray@post.com) has a Math Competitions Archive with some of the recent (back to 1991) IMO problem sets in various formats, and information about the USA Mathematical Olympiad (USAMO). He now has a separate Math Problem Directory. Archive and links maintained by Naoki Sato (ensato@hotmail.com) in Toronto, Canada. Database of problems that appeared on various national and international math competitions around the world, including detailed info about the Putnam Math Competition. Maintained by meeroh@mit.edu. A collection of mathematical brain-busters, specially for those who are tired of not-very-hard problems. Maintained by jefflock@geocities.com. Online reference to mathematical problems. Problem collections maintained by John Scholes. 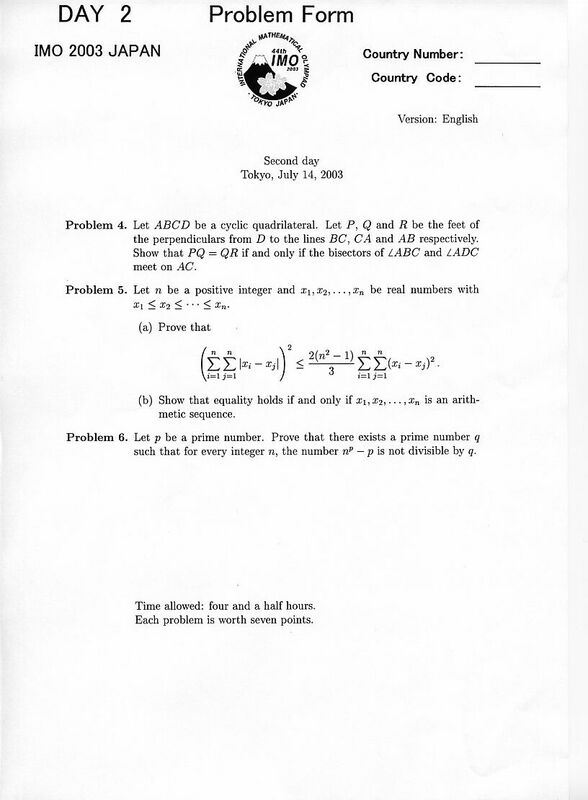 Le Thai Hoang's Math Olympiad Page contains many math problem sets, including shortlists for IMO from 1983 to 1998. A collection of puzzles ranging over geometry, probability, number theory, algebra, calculus, and logic. Hints are provided, along with answers, fully worked solutions, and links to related mathematical topics. Many of the puzzles are elementary in their statement, yet challenging. New puzzles are added on a regular basis. A key feature of the site is the detailed exposition, from first principles, of the puzzle solutions. Some of the puzzles are used to showcase particular mathematical concepts. See, for example, puzzle 56, which introduces a partition identity, and puzzle 63, where Ptolemy's Theorem permits a surprisingly simple solution. Further references are provided with many of the solutions. Inverse Symbolic Calculator When you give this program an approximation to a real number, it will do its best to decide what that number `really' is. In essence, this is a greatly expanded online version of the Dictionary of Real Numbers by Borwein & Borwein (1990). Puzzles HQ Everything Puzzles, from 3d Puzzles to Zigsaw Puzzles.